1) LCD color screen remote control. 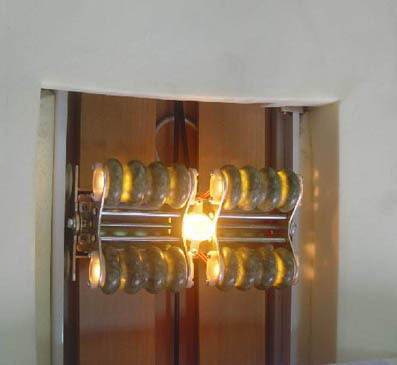 3) The back interior has 6 jades physical therapies wheel. 4) backs interior have the carbon remote infrared ray to sendthe hot plate. 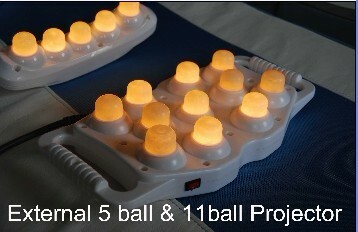 5) grasps physical therapy (13 jade balls +5 jade balls). 6) legs department ochre heat up. 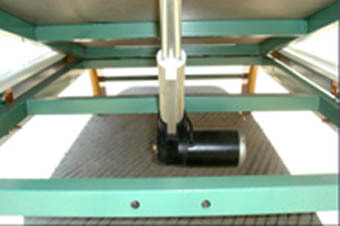 7) each bed matches a belt assistance to heat up the pad. 8) legs department automatic massages, thermotherapy. 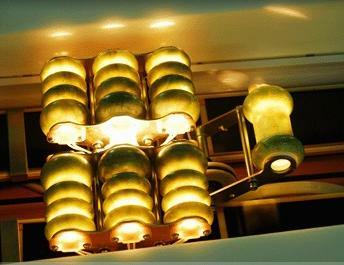 9) assembly magnetism therapy function. 10) Relied on five or six running jade massage traverse. carbon Vega heat. The Head Roller was designed specifically to focus on neck and head area which can be the reason for discomfort, the Head Roller was designed not to exceed maximum temperature of 70 degrees Fahrenheit for safety of the user. 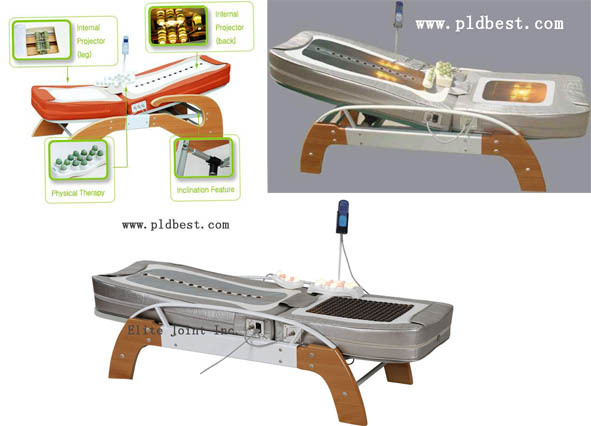 The far-infrared is controllable, keep fit for the back part and supply the thermal heating treatment. 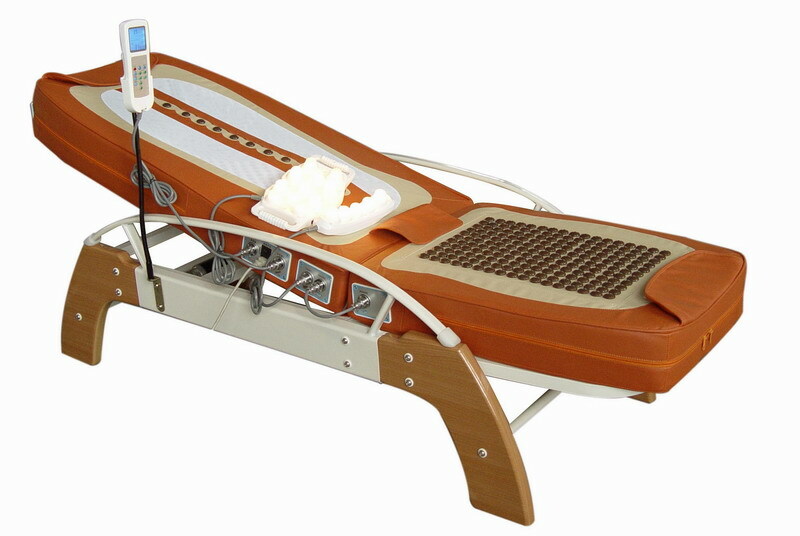 The Product Frame can be auto adjusted to inclination angles from 0-45 degrees to suit your physical condition, body characteristics or depending on which part of the body you use the product for. 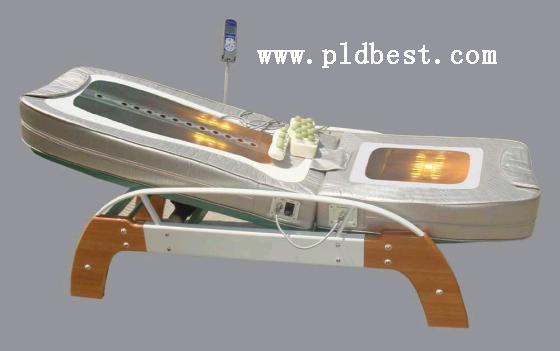 It is the latest feature of the massage bed. 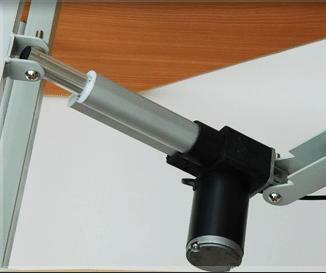 Easy button operation allows convenient selection of desired functions. LCD Color panel is more popular. 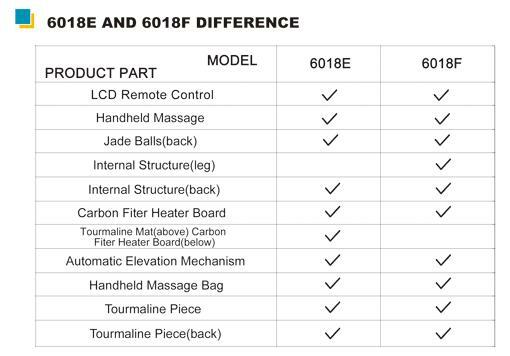 With functions: Back Automatic, Back Manual, Back Angle Adjustment, Infrared, Back Projector, Handheld Projector, Temperature Adjustment, Leg Automatic(PLD-6018F+), Leg Manual(PLD-6018F+). 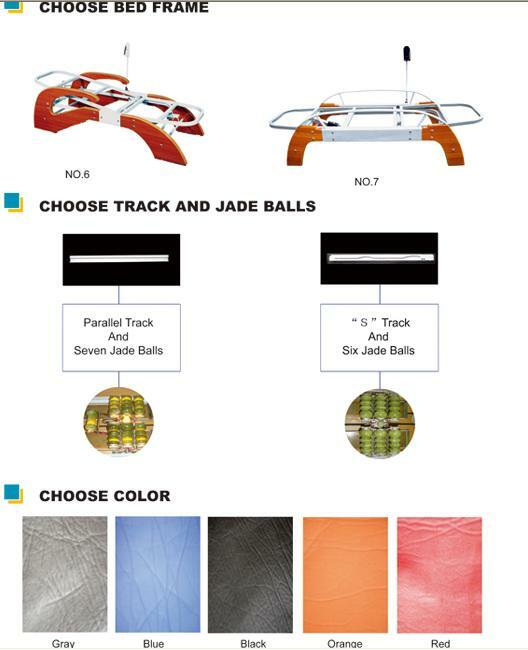 The Five-Ball and Eleven-Ball Projector comes with ergonomic design features that minimize heat and Far-Infrared Ray loss, and may be conveniently used on any part of human body. 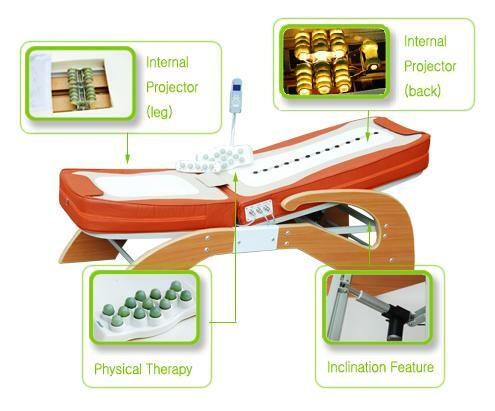 The Five-Ball Projector designed specifically to be applied on parts of the body those are not reachable by the main unit, the 5 Ball External Projector is an attachment which can be applied safely for same benefits. This attachment can also be an effective tool against numerous gynecological ailments by applying directly to the affected area. 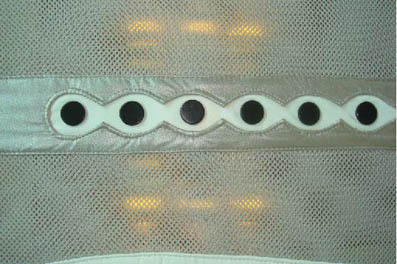 The Eleven-Ball Projector is for the stomach and back area. 11 Ball Projector applies effectively to wide areas while 5 Ball Projector applies to the areas not reachable by the main unit. So users can enjoy this with improved flexibility and vasitility. The black magnetism piece is good for the spondyle, especially to the old people. This feature is at the leg part and only with the model: PLD-6018E+. 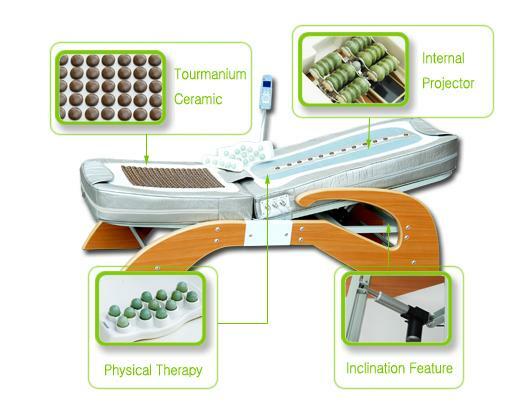 This special, auxiliary mat of Tourmanium Ceramic composition is used for enhanced heat treatment as well as for the benefits of healthful Far-Infrared Ray generation. 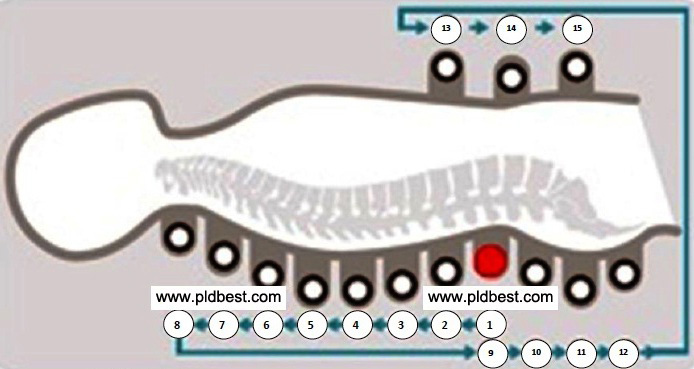 This feature is at the leg part and only with the model: PLD-6018F+. Adjustable 4 group Jade Internal Projector like the back part’s effect. Download The Manual for the Specification.